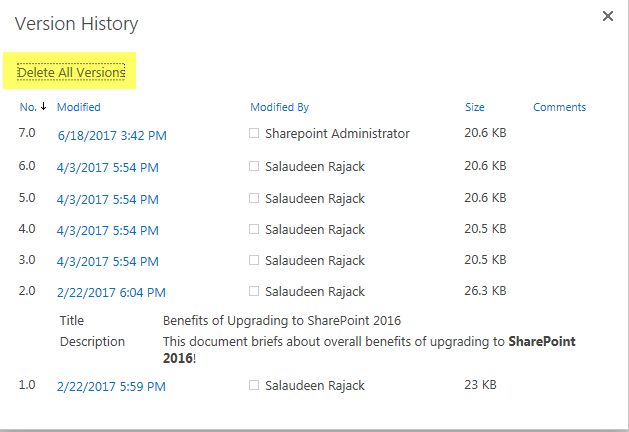 Requirement: Delete all old document versions in SharePoint site collection to free-up some disk space occupied by document versions. Because, simply disabling versioning does not deletes old versions which are already created until the next update happens on the document! So, If you want to release the space occupied by previous versions, you'll have to remove them manually. Write-Host "Deleting $($item.File.Versions.Count) Version(s) on: $($web.URL)$($item.URL)"
This PowerShell script will delete old versions in SharePoint document libraries for the entire site collection. Could you please provide me the script for SharePoint online?